You might remember that choosing a pre-k was a really difficult decision and a pretty complex process. When doing my research I discovered two dream schools that both happened to be in the Bronx. The school that JustaBXgirl had been selected to attend was neither of these. I believe the one she got into was maybe fourth or fifth on the application I submitted. I know, so sad. The dreamiest of the dream schools sent us a waitlist letter. We were 112 on the list. The other dream school? Crickets! Which basically means we were on the waitlist but wouldn’t hear from them until we had a spot. When we attended registration and toured the school that accepted her, both JustaBXgirl and I were rather impressed. It was small, clean, well organized and had a lot of fun things for her to look forward to like yoga during gym time! You’ve seen the first day of school photos. She loved this place and so did I. The teachers did an amazing job of creating a sense of community pretty much overnight. Dum, dum, dum…we got called from the dreamy school. Actually, let me back up a bit. About a week before school was to start we got called from the dream school but I didn’t get to it in time to secure a spot. Forgive me, I’m a working mom. I just missed the open spots and we were back on the waitlist. This time though we were number 1 rather than 112. We attended the orientation just in case. I met the staff from 2 out of the 3 pre-k classes and the principal. JustaBXgirl liked the school but still was happy to be going to the other one. This mama, on the other hand had her fingers and toes crossed that we would get the call. First day of school came. I called over to the dream school and even though they remembered me they still didn’t have a spot for my princess. They told me I probably wouldn’t hear anything for about two weeks. Now, can I tell you that I felt they might as well tell me two years when they said that. First day drop off at the accepted school was awesome (even if JustaBXgirl only went for two hours). Second day was two hours as well. Now we head into the first full week of school and I’m resigning myself to the fact that she might be staying there. I accepted it and actually embraced it when I realized that my baby was already loved and had a place in her school community. Thursday of the first week I got the call. We, I mean she, got into the dream school!!!! Oh, and did I mention acepted school was only pre-k. Dream school goes to 5th grade and she doesn’t have to reapply for next year. When I picked her up from school I spoke to her teacher that already knew we were on the waitlist and shared that while she would miss JustaBXgirl she knew it would be a good fit for her. She said it wold be fine for me to bring in cupcakes the next day for a going away party. I told JustaBXgirl that she would be changing schools as we walked home. I could see she was a little sad but also knew I was happy about the change so she put on a brave face. 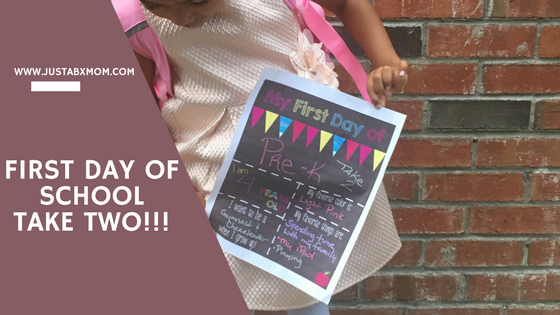 I also swayed her over by letting her know about her little party and that she would be one of the only littles to have TWO FIRST DAYS OF SCHOOL. The next day at her going away party one of her classmates asked me why she had to leave. It hurt my heart because it was a little boy she spoke fondly of and I knew she would miss him. After only a week at her school she had found a place in the world outside of home she felt safe and accepted. I questioned inf I was making the correct decision by changing her school. Thankfully, my village is awesome and prayer truly answers because they helped me find peace with my decision. First day of new school was great. No problem whatsoever at dropoff and smiles at pickup. She shared her day and told me she made a friend. Day two a little hesitation at dropoff. I chalked it up to her being tired because she went to bed a bit late the night before. Third day she had a full fledged meltdown in the morning. Her tacher handled her with kindness and the principal asked me to go and allow them to comfort her. It was one of the most difficult things I’ve ever had to do. Walking away as my baby screamed for me made me feel like the worst mama in the world but I knew it was the only way to help her. I think it was this moment when I fell in love with the new school even more. I hesitated around the school in case I needed to come back. I called up a member of my village that I knew wouldn’t laugh at me and spoke to her. A few minutes into our call the new school had called me to tell me that JustaBXgirl was doing well and had settled down and was now engaged in class. They explained that the principal didn’t want me to think him cold but he knew that the teacher could handle it. They didn’t have to call me but I was so very grateful that they did. If they hadn’t I would have been thinking the worst all day and probably sat in front or down the block from the school until it was pickup time! Judge me all you want! This week has gotten a little easier. No tears. We talk about it every morning and we make plans for the afternoon. Afterschool I give JustaBXgirl my undivided attention so that she can share her day with me and I share mine with her. I hoped to share how both first days were phenomenal but the truth is starting school can be scary. Especially when you’ve never been to school before. There’s a lot of noise, a lot of people and a lot of new stimuli to take in. If your littles are having trouble adjusting try to check in and see what might be the cause. Look at the school through their eyes. It took me a while to realize that after her first experience of being in a school that only had three classes changing to a school that was Pre-K to 5th grade was quite the difference. I am happy that I can now say I think the hardest part of the transition is behind us and we are looking forward to class spirit day this Friday. So glad that your daughter settled I to the new school. Good point to see things from her point of view. Thank you! I was really worried for a moment and had to remind myself that the new school while small to me must look like a university to her. And I’m really blessed that she is good at communicating for the most part.